This Friday, Kara Phillips will be stepping away from the typical lifestyle of a high school guidance counselor to pick up a microphone. Phillips, a counselor at West Bend East High School, is the lead singer of the local rock band Love Handle. She and her band will be performing at 8 p.m. Friday inside Pillars Pub, which will be the group’s first gig since December. According to Phillips, she has been a part of Love Handle for about six years. The band plays a variety of songs, both new and old, from a range of genres. Artists that the band covers include the Lumineers, Foo Fighters, Aerosmith, Led Zeppelin and Bruno Mars, among others. In the past, Love Handle has done occasional performances to benefit community fundraisers and charities. In November, the group appeared at the West Bend Public Schools Foundation Gala, where perhaps for the first time, her musical passion was on display for many of her co-workers, including West assistant principal Patrick O’Connor and East science teacher Skip Clark. O’Connor added that he was floored by the experience. “I literally would have paid a lot of money to go see her,” he said. 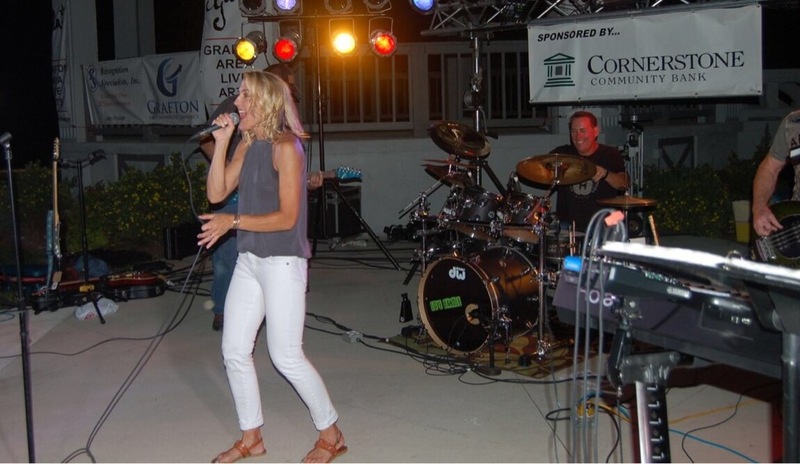 Kara Phillips with her band Love Handle during their Grafton Area Live Arts performance in July. Photo courtesy of Phillips. Similarly, Clark had been unaware of Phillips’ musical hobby. Clark also mentioned how, such as in the case with Phillips, people have different layers. “A lot of times you think of people and from the surface or what you know of them, you think that’s who they are, but everyone’s got multiple different layers,” he said. East sophomore Sadhvika Chitoor was also surprised by Phillips’ private talent, because her usual kind demeanor seems to contradict the edgier image that comes with being a performer in the rock genre. “I didn’t expect her to be a rock band singer because she’s all nice and stuff,” Chitoor said. Love Handle is not Phillips’ only musical outlet, either. She has been singing in a church praise band for eight years. She has also sung at weddings and in various choirs over the years, such as gospel and concert choirs. Phillips also voiced the joy and pleasure that performing with her band brings. “It’s been fun because everyone brings something different to the band and it’s just become this kind of goofy, silly hobby where it lets you express yourself or let off steam in a different kind of way,” Phillips said.